The oft-mentioned idea of using wireless technology to make event parking simpler and more efficient is becoming more of a reality these days, especially after the announcement this week of a partnership between stadium-app developer VenueNext and parking-management system concern ParkHub, which teamed together for parking services at Super Bowl 50. Though the two companies didn’t announce any new stadium deals other than the ones they already have in place — at Levi’s Stadium in Santa Clara, Calif., and AT&T Stadium in Arlington, Texas — the validation of ParkHub’s combination of scanning hardware and information management software could result in some big-name deals via the partnership, as VenueNext increases its roster of teams and venues using its stadium-app software platform. Right now, the main value of ParkHub’s PRIME mobile point-of-sale system (and specialized scanner equipment from Verifone) is that it allows parking-lot attendants to quickly accept and verify a wide range of payments — including cash, credit card or scans of printed tickets or digital-device graphics — to first speed up parking-lot entry, and to second provide detailed information to venue parking operators. At Super Bowl 50, ParkHub and Verifone said the system was used by more than 7,000 cars as well as several hundred buses and limos, at one point getting vehicles into the lots at a pace of one car every two seconds, a welcome improvement over the sometimes-crawling lines we’ve all been in at one point or another. As VenueNext signs up more stadium customers like its recent deal with the Minnesota Vikings’ U.S. Bank Stadium, it will be interesting to see how many times ParkHub can piggyback alongside. Right now, ParkHub seems to be one of a couple companies with momentum in the still-nascent event-parking technology market, one that has been talked about a lot for the past few years without much real action where the rubber meets the asphalt lots. Another service, Parking Panda, has several partnership deals with sports teams for its find-and-reserve parking service as well as for a mobile POS system similar to ParkHub’s, according to ParkingPanda chief operating officer James Bain. In a phone interview Bain said Parking Panda provides game-day services for the New England Patriots, the Tampa Bay Rays and the Washington Nationals, as well as for the Los Angeles Convention Center. Other entrants, like StadiumPark, had similar ideas but haven’t yet announced paying customers. While VenueNext’s fan-facing app has had some parking features like interactive maps directing fans to lots, the actual on-site transaction part of the equation hadn’t been solved until late last year, when ParkHub was brought in under a test relationship, which extended to the Super Bowl. Look for the Dallas-based ParkHub, which according to chief marketing officer Jarrod Fresquez was running parking operations at AT&T Stadium for the recent WrestleMania 32 and its associated WWE events, to be part of the VenueNext-based services available for Dallas Cowboys games this fall. 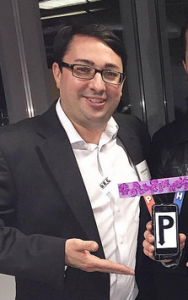 In a phone interview with Fresquez he described ParkHub’s deep DNA in the parking business, with founder and CEO George Baker being the son of the head of the Parking Company of America in Dallas, where George worked since he was apparently old enough to hold up a “park here” flag. “I think George has been working in parking since he was 2 years old,” said Fresquez. After an initial foray into consumer parking, ParkHub pivoted into the business-to-business model of performing transactions and relaying information gained to venues and event operators. Fresquez said ParkHub’s strengths include its tight integration with TicketMaster systems, allowing for “real-time” validation of parking passes issued by the ticketing giant. The parking information gathered by the ParkHub system can also be sent to platforms like VenueNext’s, which can use it to gauge which lots are filling up and relay that information to fans. More importantly for venues, digital parking systems also help eliminate potential losses of cash-based systems, aka the apron method. In addition to speeding up the parking process, digital systems like ParkHub’s also provide invaluable granular marketing information, about how many fans use credit cards or pre-purchased parking passes, for example. Those statistics and integration with other fan data are a big part of the VenueNext selling proposition for its app technology and management systems for venue owners and operators. ParkHub, which also counts the American Airlines Center in Dallas and Amelie Arena in Tampa among its current clients, is also testing some automated-gate technology at American Airlines Center, according to Fresquez, part of its quest to “continue to innovate and improve” the venue parking experience. Here at Mobile Sports Report we often wonder why technology can’t also be applied to perhaps the biggest problem with event parking, namely the crush formed by fans leaving the lots after games, where mass confusion and Mad Max-type behavior often rules the day. According to Fresquez, ParkHub is working on sensor technology which someday might allow fans to reserve specific spots in lots, like the ones closest to the exits to facilitate a quick departure. Until then, we’ll have to settle for assistance with paying and parking lot entry, which while not complete is still welcome.